In classrooms with long-time educators, most teaching and learning involves technology. Even with assignments, less than half — 42 percent — of student work is done using paper and pencil, according to a new study conducted by MidAmerica Nazarene University. The study involved 1,000 K–12 teachers who've been in the profession for a minimum of five years. It found that teachers are overwhelmingly positive about technology in the classroom, with 66 percent saying it makes students more productive and 60 percent saying it stimulates them more intellectually. A full 82 percent said technology tools "have not only brought the classroom into the modern age, but they have also enhanced learning and teaching." 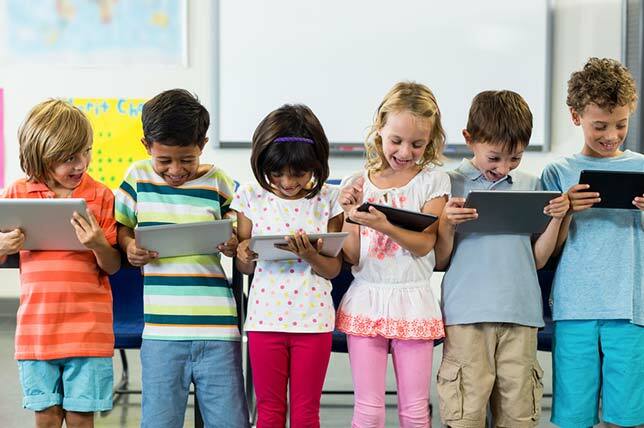 73 percent of teachers said their students use tablets or laptops daily. 86 percent of teachers have WiFi in their classrooms. 62 percent said students use their own technology in the classroom. 70 percent said phones cause "tension and disruptions in the classroom." Typical rules for phone use include silencing them and putting them away during exams. 36 percent said they deal with phone disruptions on a daily basis. 61 percent said tech makes students physically less active. 38 percent said tech makes students more social, with 36 percent saying it makes them less social. The remainder said it has no effect. The complete study is freely available on MNU's site.